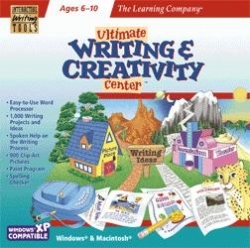 "Ultimate Writing & Creativity Center"
Ultimate Writing & Creativity Center combines easy-to-use writing and creativity tools with special educational features that help children learn to write. Inspires and motivates with an exciting world filled with interesting facts, imaginative ideas, and interactive characters! Coaches young writers through the five stages of the writing process: prewriting, drafting, revising, editing, and presenting. Transforms documents into multimedia presentations—complete with music and animation! Explore 4 exciting lands—Rain Forest, Desert, Space, and Ocean. Click on animated objects for over 1,000 writing ideas. Paint your own pictures, or add clip art, photos, sound, music, and animation to brilliant backgrounds. Penny coaches you through the writing process with encouragement, suggestions, and checklists.